Although the origin of the quote is up for debate, you've no doubt heard it said that the definition of insanity is "doing the same thing over and over and expecting a different result." (But, if you really think about it, this doesn't make much sense. That sounds more like the definition of "perseverance" to me.) This idea could certainly be applied to movie adaptations of Stephen King novels. By 1993, there had been 25 movies based on some sort of work by King. Of those, I would say that only 6 are halfway decent movies. But, that didn't stop Hollywood from going back to the King well over and over again. hey, if the book is popular, then the movie should be as well, right? 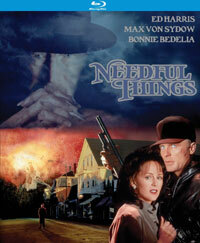 1993's Needful Things shows that it's not always easy to turn a novel into a film. Needful Things takes place in the town of Castle Rock (which has been featured in other works by King), which is a fairly ordinary small town. Leland Gaunt (Max Von Sydow) has just opened a new store called Needful Things, a curio boutique which somehow has exactly what each customer desires. But, that's not the oddest thing about Mr. Gaunt's store. He doesn't ask his customers for money -- He asks them to play a prank on someone else in town. The key is that these pranks are specifically targeted towards the petty, jealous, and paranoid citizens so that they will automatically assume that a particular person had perpetrated the trick. Soon, the townspeople are at each other's throats (literally) and Sheriff Alan Pangborn (Ed Harris) must not only attempt to keep the peace, but also figure out what is causing the unrest. Can he keep things under control while also watching over his fiancee, Polly (Bonnie Bedelia)? Clocking in at over 700-pages, Needful Things is another one of King's magnum opus' -- a huge novel packed with characters and subplots. Veteran filmmaker W.D. Richter was faced with a choice with the screenplay -- Either attempt to adapt the actual novel or simply lift the main idea and run with that. For some reason, he split the difference and sort of did both. The movie retains some of the main characters from the novel and some of the main ideas, but for the most part, following a somewhat slow opening, the movie sprints through plot points without stopping to explain or examine anything. Rumor has it that the original cut of the film was three hours long, and that presumably contained more story. (If you look closely, in two scenes you will see a woman wearing gold sunglasses. That character is from the novel and the glasses once belonged to Elvis.) One subplot from the book which was not part of the movie was that Mr. Gaunt hired Ace Merrill to be his henchman. If that name sounds familiar, the character was portrayed by Keifer Sutherland in Stand By Me. This was an older Ace, who was still an evil loser. Also, I can't help but wonder why they changed Polly's business from a sewing shop to a diner. The fact that she couldn't sew due to her arthritis was more effective in the book. So, what we are left with is not a total mess, but it comes close. Director Fraser C. Heston (Yes, Charlton's son) makes his feature film debut here, and he's clearly in over his head. The first indication of this is the editing. At several points in the movie, instead of letting two separate scenes play out, the film jumps back and forth between them at seemingly random intervals, rendering both scenes nearly incomprehensible. It's not surprising that the movie feels the need to jump back-and-forth between the various storylines, but the fact that it can't wait to do so is unnerving at times. The second clue is that it appears Heston couldn't keep his actors on a leash Ed Harris and J.T. Walsh chew the scenery, while Von Sydow is actually too subdued. In essence, Needful Things plays like a combination of King's own 'Salem's Lot and Ray Bradbury's Something Wicked This Way Comes in which evil creeps into a small town in the form of someone who can grant the citizens their fondest wishes. It's a relatively simple premise which King uses as a jumping-off point in the novel to explore how regret and jealously eat at people and how quickly they can turn to violence if they feel like its justified. Ostensibly, these concepts appear in the film as well, but they simply aren't fleshed out enough. So, we are left with some ideas, some poorly edited scenes, some violence, and little else. Like a lot of King's work, Needful Things would have really lent itself to being a mini-series, so that the entire town could have been explored before it became unhinged. What we get feels like the Cliff Notes version. Needful Things reminds you to keep your receipt on Blu-ray Disc courtesy of Kino Lorber. The film has been letterboxed at 1.85:1 and the Disc contains an AVC 1080p HD transfer which runs at an average of 20 Mbps. The image is sharp and clear, showing only a mild amount of grain and no defects from the source materials. The colors looks good, but the picture is just slightly dark at times. The depth is fairly good and the level of detail doesn't disappoint. The Disc carries a DTS-HD Master Audio 2.0 track which runs at 48 kHz and an average of 1.6 Mbps. The track provides clear dialogue and sound effects. The finale provides some nice stereo effects, and the front-channel separation is good. The score sounds fine and never drowns out the dialogue. The Needful Things Blu-ray Disc contains only two extras -- an AUDIO COMMENTARY from Director Fraser C. Heston and a TRAILER.